Professor Looper-Friedman has also studied comparative law and jurisprudence at Magdalen College, Oxford University, in England. She joined the Capital faculty in 1985 after practicing law and teaching at the undergraduate level. Professor Looper-Friedman has published articles in the areas of Roman law, domestic violence, property theory, and reproductive rights, and has prepared her own teaching materials on legal history, legal theory, and comparative women's rights. 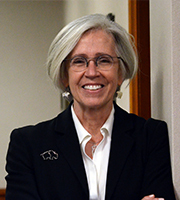 She teaches Property Law, Land Use, Comparative Law, Jurisprudence, and Decedents' Estates, and has served as faculty advisor to the Women's Law Association, the Native Law Students Association, and the Jewish Law Students Association. Professor Looper-Friedman served for 27 years on the state board of the American Civil Liberties Union of Ohio, serving as a legal committee member, chapter president, national delegate and state board member. She is a frequent public speaker on civil liberty issues. In 2012, she was honored at the Ohio ACLU's biennial conference with the Flame of Liberty award for her contributions to civil liberties in Ohio as a member of the Board of Directors from 2000-12. Professor Looper-Friedman enjoys sailing, weight lifting, and playing cello, banjo, and piano.